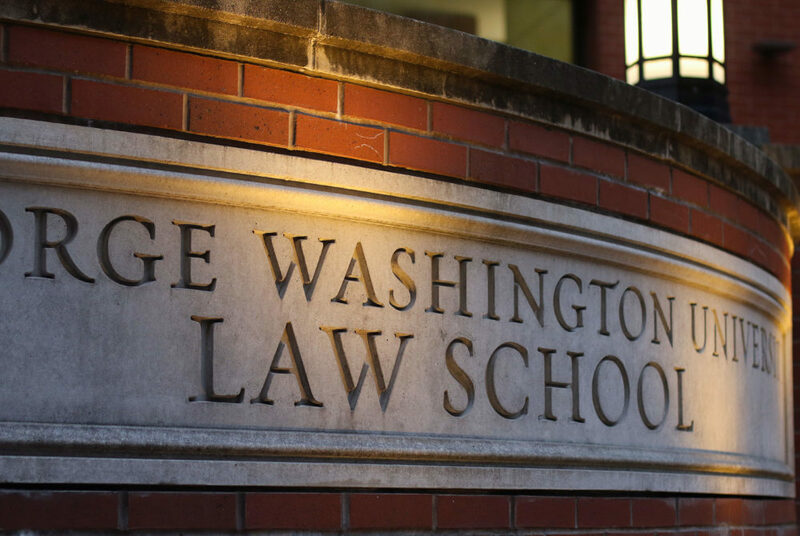 Months after students first raised concerns that the president of the Student Bar Association made an insensitive remark about a Jewish student group, students say law school administrators have done little to address the situation. Blake Morant, the dean of the law school, contacted members of the SBA and the Jewish Law Student Association last month to host mediation sessions in the spring to help “resolve the current controversy and move toward healing the community,” according to an email obtained by The Hatchet. But members of JLSA and SBA senators, who spoke under the condition of anonymity for fear of retribution from law school administrators and the SBA executive branch, have said officials “swept the incident under the rug” by pushing a resolution to the spring and have not provided closure to students involved. Law school spokeswoman Liz Field said officials “hope to bring healing to the law school community” after the incident. She said administrators have served in an advising role to student groups involved in the incident and are “supporting” those involved. “We also hope to host a town hall meeting in the near future for our entire community that charts the course for greater communication to benefit our current students and those of future generations,” Field said in an email. She declined to say how many and which students administrators have spoken with. She declined to say whether officials were conducting a fact-finding investigation into the allegations against Kingston. She also declined to say why officials decided to hold mediation sessions in the spring semester. Members of JLSA said Kingston still has not adequately apologized for the alleged comments, and the planned mediation sessions drag out the issue to dodge bad publicity. A member of JLSA said officials have been “very vague” about what the mediation process will entail and when exactly the process will occur next semester. They said the delayed timeline is a way for administrators, who have not issued a public statement about the incident to the student body, to bury the issue until it’s out of the spotlight. “They’re not interested in releasing any statements as of yet or asking for any accountability from Ali, which is troubling to me,” the student said. “I think the school, to an extent, has put this shield around her, and I think that we need to make sure people are held accountable in an appropriate and acceptable way,” the student said. “Unfortunately, the longer this goes, the more people forget about it and the more it becomes accepted that these comments were made and nothing has been done about it,” they said. Kingston said initial meetings have been held about the mediation, and details about the structure and schedule for future mediations are still in the works, but she hopes all students involved in the incident can find closure at the end of the process. She said the law school and other parties involved in the incident did not handle the situation properly, but she hopes the process will give students and officials the experience to address future conflicts that are similar in nature. She did not return a follow-up request asking how the law school and other parties mishandled the situation. “Though I am trying to move forward from the extreme harassment I encountered because of the false allegations, my main concern remains the student body and wanting to be part of a process that is best for them,” Kingston said. SBA senators said the incident also has not been discussed among the SBA Senate since the group hosted a town hall with Kingston in October one week after passing a resolution calling for her resignation. Senators said they would like to form a committee to investigate the allegations in place of the mediation sessions. An SBA senator said that both officials and the organization’s executive branch did not properly address the issue because Kingston did not take full responsibility for her alleged actions. “It doesn’t take that much to apologize, take responsibility for the situation and do what’s best for the student community,” the senator said. Another SBA senator said the senate has done little since the conflict, and some senators seem to have been “bullied” into discussing the possibility of rescinding the resolution calling for Kingston’s removal. But the senator said they do not think the senate has the votes to revoke the legislation. They said Kingston should have made the alleged remarks public of her own volition and held an open forum before exams and papers were due to address the situation. The senator added that she should come to senate meetings to speak with senators because they have not seen or interacted with her in the weeks following the special senate meeting in October. The senator added that Kingston should resign, effective after finals, and the SBA should appoint an acting president. Leila Giannetti, Parth Kotak, Amy Liu, Alec Rich and Hayden Smith contributed reporting.